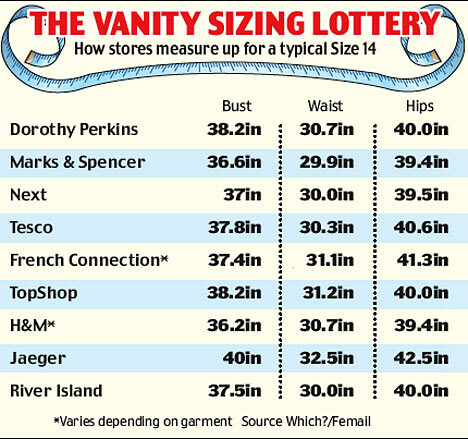 This is a hot topic in the fashion industry, and in women’s changing rooms up and down the country: Vanity sizing. Vanity sizing means that someone who may be a size 14 in one brand, is a 10 in another, but can barely squeeze in to a size 18 elsewhere. It’s not right, and it can play havoc with our self esteem as women. I know that personally I have flat out refused to buy an item of clothing that I like, and that fits me well, just because of the number on the label. I used to think this was just me, a throwback to my disordered eating past, but this phenomenon seems to affect an increasing number of women. Dame Sally Davies, the Chief Medical Officer for England, has recently come out with some opinions (some of which are not going to prove popular) who said recently that being overweight had become ‘normalised’ in our society, where even clothes manufacturers alter the number on their labels so that people carry on buying their clothes without actually realising that they’re getting bigger. She emphasised this point by revealing that a woman that a current UK size 14 would actually have been a UK size 16 in the Seventies. Similarly, a size 10 waist has grown from 24 to 28 inches in the same period, according to a recent study. It comes as no surprise that studies have found that smaller sizes on labels have a direct affect on the self esteem of customers. Obviously a customer is going to be affected by this. It doesn’t matter how rational, educated or intelligent you are; if you fit in to a smaller size than expected you feel this rush of happiness… and you buy it! Simple as that- vanity sizing sells clothes. I think vanity sizing is just dumb. Everyone everywhere should be using the exact same sizing charts so ALL your clothes have the same size in them. It ridiculous to go through your closet and see one pair of jeans that say size 2 and another size 18 but they’re both the exact same size. I completely agree! It would be so much easier if sizes were standardised! Maybe one day it’ll happen but I doubt it! A few big names in the industry need to get together and introduce it I think!